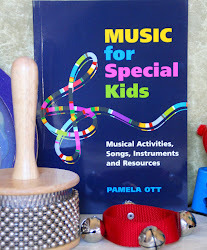 Check out this new study on music and its potential effect on shaping your child's brain. "Learning an instrument enhances the brain's sensitivity to all sounds, including speech, say researchers." Once they have mastered the letter recognition from the last post, try playing full words! Here are some of the words you can make using the "musical alphabet". Once your child has mastered the words you place on the keyboard, see if they can create and sound out words of their own! 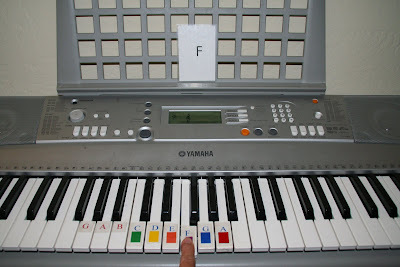 Another activity to do with the color/letters adhered to your keyboard is letter recognition. I printed the letters of the musical alphabet (A,B,C,D,E,F and G) on 3x5 inch cards and laminated them so they would last longer. I made several cards for each letter. 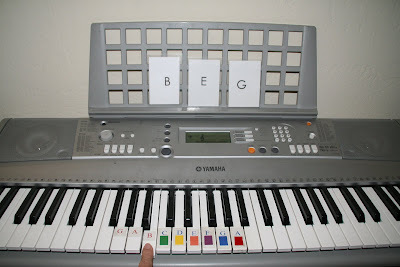 Place one letter on the keyboard and ask your child to play the corresponding key on the keyboard. Once all 7 letters are mastered, try 2, 3 or 4 letters at a time!